Activision offered the former Infinity Ward bosses more autonomy in exchange for their continued employment, but allegedly had no intention of holding up its end of the bargain. Jason West and Vince Zampella, the former heads of Call of Duty studio Infinity Ward, have updated their complaint against their former employer, Activision. Along with the allegations of breach of contract and unpaid royalties, the pair is adding a count of fraud to the suit, saying that Activision was less than honest with them during its merger with Vivendi. This new charge says that Activision entered into a Memorandum of Understanding with West and Zampella in 2008 in order to secure their continued employment for a further three years. 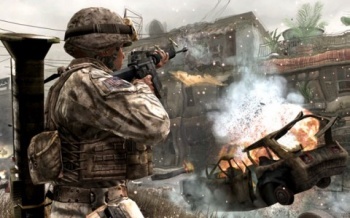 The MOU granted Infinity Ward a certain degree of autonomy over the Modern Warfare brand, on the condition that the two men remained employed. "To protect its interest in consummating its merger with Vivendi Games," the complaint reads. "Activision needed to do everything it could to keep West and Zampella content with their responsibilities and compensation at Infinity Ward. This gave West and Zampella considerable bargaining power in their negotiations with Activision." According to the complaint, the pair was skeptical about the autonomy hinging on the continued employment - wondering whether Activision would simply fire them to regain control over the brand - but apparently, Bobby Kotick himself has assured them that it would be impossible for the pair to be fired. Because of this assurance, the pair signed the contract without pushing for a more solid commitment from Activision. Now, West and Zampella allege that Activision never had any intention of honoring the contract, and in fact undertook secret development of Call of Duty projects that it should have consulted Infinity Ward on, as per the terms of the MOU. "Activision did not inform West or Zampella of such plans or seek their input or approval for them," the complaint said. "Indeed, while breaching the creative authority provisions of the MOU, Activision continued to pay lip-service to them, in an attempt to mask its secret development efforts." A lawyer representing the pair told GameSpot that as well as damages, West and Zampella wanted to get a recession of the MOU, which would mean that they would co-own the Modern Warfare brand. This would allow them to create new games in the franchise, and release their own copies of existing games. This isn't the first alteration of the lawsuits between Activision and West and Zampella. In January, Activision was successful in adding EA to its complaint against the pair, saying that the rival publisher colluded with them to delay the release of a map pack for Modern Warfare 2 so that it didn't get in the way of the launch of Battlefield: Bad Company 2. EA tried to have the charges against it dismissed, but last month a judge ruled that there was enough evidence for the suit to go ahead. It's hard to predict who's going to win this case, but it's not going to be over quickly.